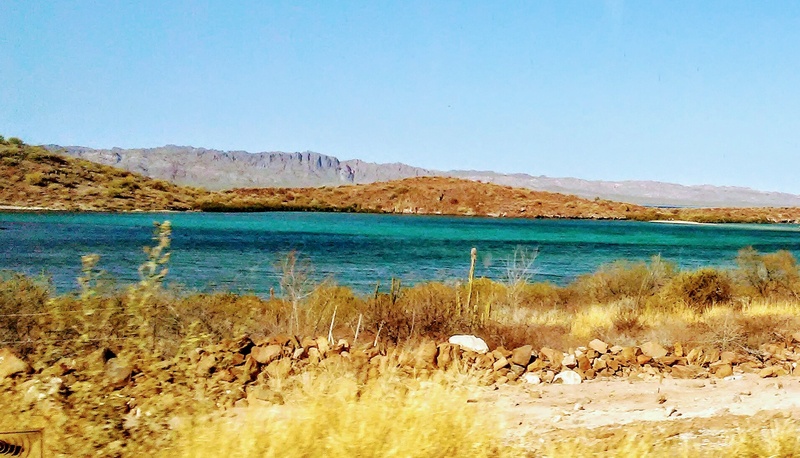 While we spent the majority of the summer on the Sea of Cortez, we also made a few road trips back to the states for provisions, parts and other necessary items. There are just some things you can’t find here and you don’t have things shipped here because chances are you’ll never see them. I’m not implying that the Mexicans are corrupt; it’s just a fact and you have to learn to live with it. We made two trips back to California and one to my cousin’s house in Arizona. Each trip took us through different parts of México. One trip was from Puerto Peñasco through Tecate to San Diego. One was from Puerto Peñasco to Peoria, Arizona and the other was from Santa Rosalía to San Diego. Each trip revealed different and spectacular landscape that had its own appeal. I would dearly have loved to stop along the way to take pictures but time was always pressing. So, I did the next best thing. I took pictures from the car as we cruised down the highways. Ironically enough I was able to capture some pretty great images this way. All photos and video were taken using my iPhone 6 Plus. I’ve found the camera on it to be pretty nice. Beautiful sand dunes on the way out of Puerto Peñasco. The mountains on the way into Tecate. Winery in the wine district. Coming into Ensenada at sunrise. Yes, the Hotel California really does exist! We didn’t stop…were afraid they wouldn’t let us leave! Just outside San Quitin. There is a lovely hotel there called the El Jardin…highly recommend it! Boojum tree or as it’s know in Spanish…the Cirio. We call them Dr. Seuss Trees. Cardon Cactus are the largest cacti in the world. Very beautiful to see. Horses, cows and other animals stand along the roads. You always have to be watching. They can walk out in front of you at anytime. Mexican roads can be treacherous at best. This is an area that was washed out during Tropical Storm Lidia in September.